I have recently been given these bears. 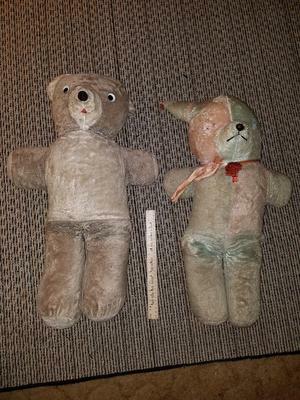 I was not told very much about them other then they are old vintage bears. Sadly there are no tags on either bear. Neither of them have any holes, rips or tears. The stuffing is a little on the firm side but soft. They appear to be stuffed with the original stuffing. I believe they may be from the 1940s or 1950s. The one I will call the birthday bear (looks like a birthday hat on one ear) it's eyes have been broken off. They are in very good used/vintage condition. Both are 24 plus inches in height. The bear that still has his eyes has a felt tongue. The birthday bear has a hard plastic nose. The pom pom on his chest has been pulled away from the body, but is still attached. The ribbon around his neck is a satin ribbon. (Not sure if that was originally on the bear.) Their color is good in my opinion. These were purchased probably in the 1950s. The original owner of one of the bears has passed away and the other owner doesn't remember. (The original owners were sisters and their dad got them for them.) The surviving sister is unsure of where they were acquired because their dad was in the air force and could have gotten them from anywhere in the world. These were such a great gift given to me I would love to find out as much about them as possible. Thank you very much for taking the time to look at my bears and sharing any info with me that you can about them. They really are nice bears considering their age. And the more I can learn about them the better. Also how or where would be a good place to Have them cleaned? Or is having them cleaned not a good idea? Have a wonderful day.